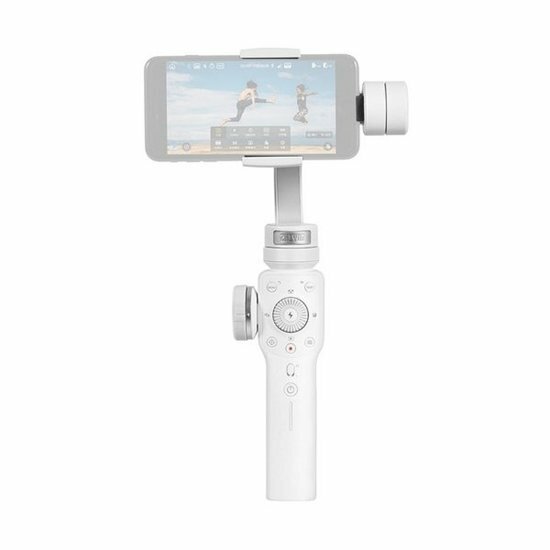 The Zhiyun smooth 4 smartphone stabilizer has been designed to provide cine-style functions to content creators using their mobile phones for video capture. When used with the free, downloadable zy play app, the control panel enables Android and IOS users to control both Gimbal and smartphone camera functions such as focus, zoom, time-lapse, and still photo settings. The smooth 4's controls reduce the need to touch your phone's screen, thereby minimizing unintended jostling while recording. A dedicated "vertigo" function emulates the perspective-shifting, dolly/zoom Effect dear to many filmmakers. Compared to the zt smooth-3, the smooth 4's controls are more ergonomically laid out and better labeLED with icons. The smooth 4 also has a significantly larger focus/zoom wheel, a phonego mode for quickly grabbing the action, multiple time-lapse functions, and object tracking. With the ability to support smartphones weighing up to 210g and measuring up to 8.5cm high, the smooth 4 is compatible with almost any mobile phone. In a nod to its filmmaker-centric design, the smooth 4's large focus wheel even has a witness mark that can be lined up to focus marks you place on its textured band. The wheel is located on the lEFt side of the handgrip, with a button placed to its lower right that lets you toggle between focus and zoom functions, with a button light indicating zoom mode. Scroll and press to select settings with the central menu/return button, or choose the parameter display button to switch between close shooting, still photo, and full-auto modes. The smooth 4 offers 320° of pan and 240° of tilt and roll for nimbly capturing your action shots, or for smoothly gliding along more tranquil scenes. Choose between pan-following, locking, full-follow, or the full-speed phonego mode to adjust your level of axis control while shooting. Powered by rechargeable lithium-ion batteries, the smooth 4 features a maximum runtime of up to 12 hours. A USB type-c port on the handgrip enables you to add a separately available power pack to extend your shooting time even further. An LED display indicates your remaining power, and an output port enables you to charge your phone while shooting with the stabilizer. The Zhiyun smooth 4 smartphone stabilizer includes a mini tripod, carrying case, and a USB cable. A single 1/4"-20 female thread on the handgrip bottom can be used to mount the stabilizer onto the included tripod or other support, or to attach a compatible accessory.